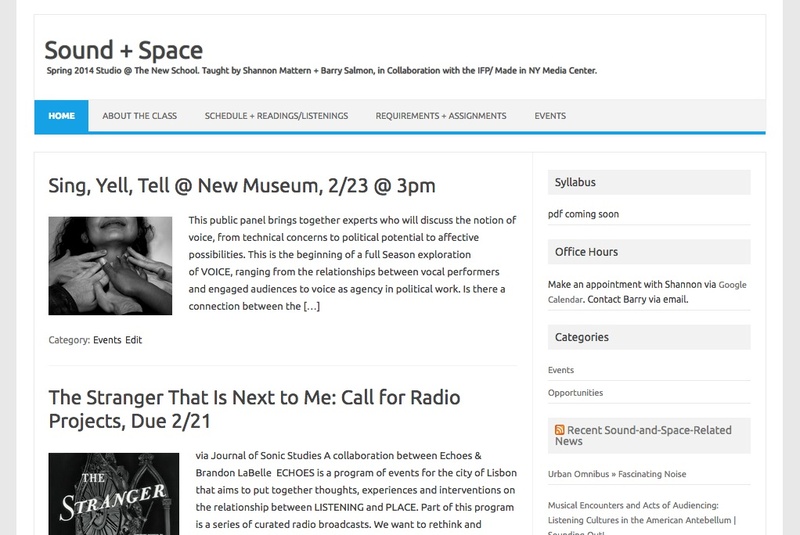 Classes begin next week, and I’ve nearly finalized the syllabi and websites for both my “Digital Archives” studio and the “Sound and Space” studio I’m co-teaching with my colleague Barry Salmon. I’ve got lots of exciting things planned for the Archives class: we’re meeting regularly with The New School’s archivists — Wendy Scheir, Liza Harrell-Edge, and Jenny Swadosh — as well as with some of the founding faculty from my program (since one of our goals is to highlight the history of media study and media-making at TNS). We’ll also be visited by Thomas Lannon, Assistant Curator of Manuscripts and Archives at the NYPL and Ben Vershbow, Manager of NYPL Labs; Seth Kaufman and Julie Weist from Collective Access; and designer Jane Pirone, who’ll lead us through a user-testing workshop. We’re doing interface critiques; developing finding aids for imaginary collections; taking a field trip to ArtStor; and hosting a pecha kucha to solicit mid-semester feedback from external critics — Orit Halpern, Peter Asaro, and Alex Kelly — on our semester projects. I think we have the makings of a great semester! “Sound and Space” is equally exciting — in large part because it’s taking place in the new IFP/Made in NY Media Center in Dumbo, which affords us the opportunity to explore the soundscape of a new environment and the opportunity to open up some of our programming, including exhibition of student work, to the public. But because we have to coordinate the schedules and interests of a few different entities to make things happen, some of our plans are still gelling. That said, we’ve got a nearly-finalized semester schedule — complete with lessons on resonant bodies, sounding objects, sacred spaces, sounds of nature and environment, sound and architecture, the design of sound-spaces, soundwalking and -mapping, sonic histories of place, etc. We’re also going to see Wozzeck at the Metropolitan Opera, and I’m sure there’ll be lots of other relevant performances and exhibitions we can take advantage of, too. What’s more, I think we’ve designed some great exercises: chronicles of sound-events; audio-catalogues of various urban “acoustic characters”; sound maps of presences and historic traces. And as more plans concretize, we’ll add them to our website.